In this important book, Dr. Laura shows men and women they can have a Good Life no matter how Bad their Childhood. For each of us, there is a connection between our early family dynamics and experiences and our current attitudes and decisions. Many of the people Dr. Laura has helped did not realize how their histories impacted their adult lives, or how their choices in people, repetitive situations, and decisions - even their emotional reactions - were connected to those early negative experiences, playing a major role in their current unhappiness. Dr. Laura will help you realize no matter what circumstances you came from or currently live in, you are ultimately responsible for how you react to them. The acceptance of this basic truth is the source of your power to secure the Good Life you long for. In her signature straightforward style, with real-life examples, Dr. Laura shows you what you will gain by not being satisfied with an identity as a victim, or even as a survivor - but striving to be a victor! 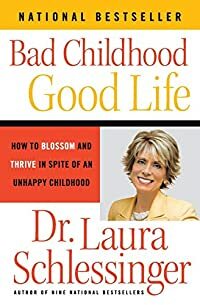 In Bad Childhood - Good Life , Dr. Laura will guide you to accept the truth of the assaults on your psyche and soul, understand your unique coping style and how it impacts your daily thoughts and actions, and help you embrace a life of more peace and happiness. Bad Childhood - Good Life comes from a compassionate and personal place. Dr. Laura also reveals some of her own experiences with a difficult childhood and what efforts it took to attain a Good Life. She writes, "My resilience has paid off, and I'm doing the best I can with what I've got." Now you can, too.